My eleven-year-old and his gang of thugs are a bunch of scofflaws. Never mind that they are fabulous, sweet, smart, kind and hilarious, the lot of ‘em. To L.A. County they are lawbreakers. 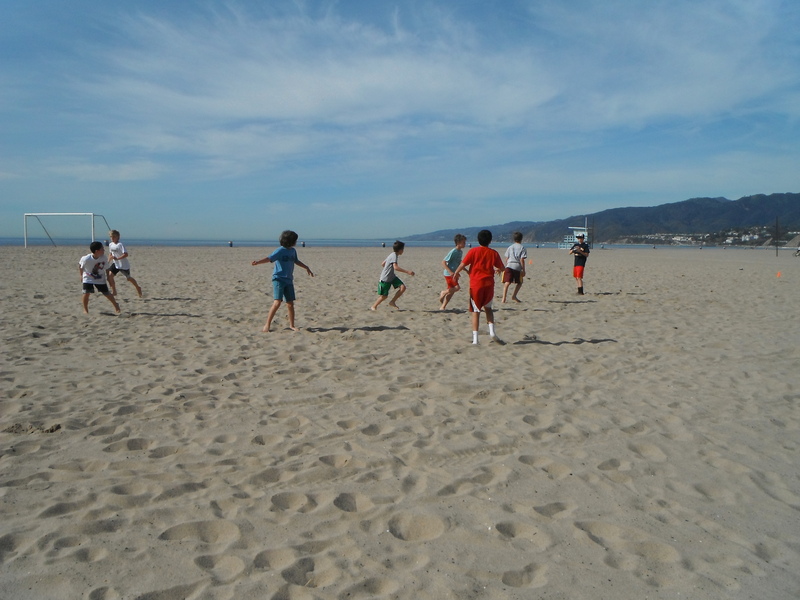 Their heinous crime: playing football on the beach. The beach is the last free and public place. It’s no small thing to find a place where a gaggle of boys can run and be free. Soccer and LaCrosse and Baseball leagues compete for open fields. Our local park is fenced and locked when its field-time isn’t taken up by organized leagues. Birthdays at Laser Tag or Mini-Golf run into hundreds of dollars before anyone touches a bite of pizza or cake. 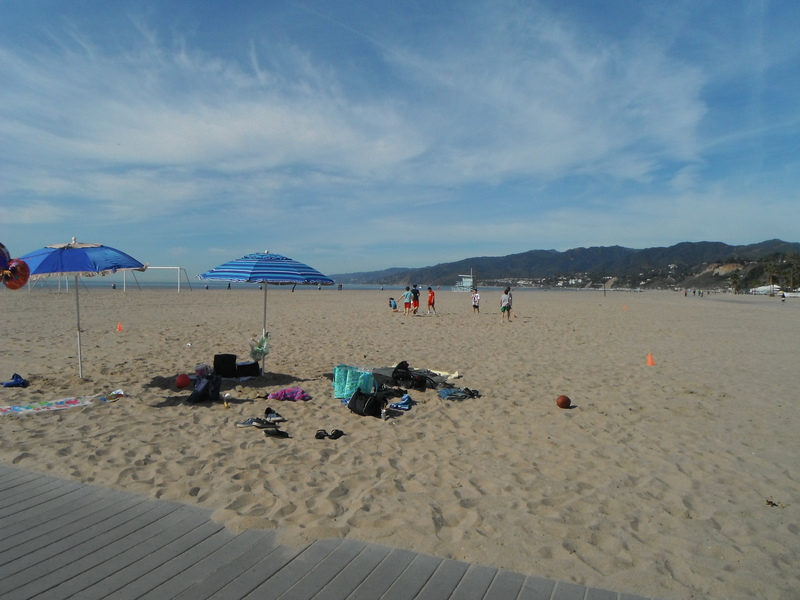 But the beach belongs to all of us, and there’s nowhere I’d rather be on a gorgeous L.A. January day. So for our son’s 11th birthday last month, we took twelve boys to the beach. We brought a small football, two umbrellas, a cooler of drinks and a tub of Double Bubble. Except for a lunch break at the public Annenberg Beach House’s Back on the Beach Café for mid-day sustenance, those kids played nonstop from 11:00 a.m. until we dragged the last of them away at 4pm. They ran, threw, tackled, dove, shouted and laughed on the wide white sands between the bike path and the Pacific. We had to call them back from the sand and their X and O formations to eat birthday cake. It was, for these athletic boys, heaven. Nothing but space and freedom. No coaches. No referees. No flags. Just them, their rules, their game. One of my friends tells us her son can’t stop talking about how much fun it was – “the best birthday party ever.” How beautiful that it took so little for these kids to have a perfect day. Imagine my shock to learn that L.A. County rules governing the beach make it “unlawful for any person to cast, toss, throw, kick or roll any ball, tube or any light object other than a beach ball or beach volleyball upon or over any beach….” Title 17.12.430. There’s been buzz about this lately, but when I looked into it, I discovered it’s nothing new. Actually, this language clarified a previous rule that prohibited throwing or tossing balls other than “inflatable rubber balls not less than 10 inches in diameter.” So it looks like the beach volleyball lobby is in cahoots with the Sups. But quit complaining, because the new rule carves out an exception for the off-season, September through May. This is progress. The penalty for violating the rule is still a $1,000 fine. I wonder if the fine is per game or per person – twelve thousand dollars for a birthday beach football? The County has a right to make rules for good beach behavior. I’ll raise my hand in favor of the bans on spearfishing, oil pollution and smoking at the beach (cigarette butts being the number one trash item found in beach cleanups). But outlawing frisbees? Prohibiting holes deeper than 18 inches? Where’s the fun there? Those of you who want the freedom to toss, throw, kick or roll whatever kind of ball you happen to have in the car trunk when you head to the waves, pay attention: Your time is now. Occupy the beach. Draw your line in the sand. Dang, watch out for the LA beach nazis! Its cold in Oregon, but we like our games. What happened to those American freedoms? The irony is that the hullaballoo about the rules comes in reaction to L.A. County RELAXING restrictions that have been on the books for years, by making the months of September through May exempt. Peter and I were thinking that Dad should get involved with this, but it sounds like you should do it! If there was any a time to sue it’s now! Occupy the Beach!!!!!!! Proud of you, Sis. No, Roger (your dad) should get involved. You know how he likes to fight the establishment. Written by his old secretary, Cheryl. Part of the burden and blessing of being a former lawyer is that I do, on occasion, still read the fine print. If you read my whole blog, you’ll see that I reported correctly that the Supervisors’ action last week was a relaxing of current rules, exempting the months Sept – May from the former year-long ban. Admittedly I did not lead with that, because the rules are still nonsensical. Why is a beach ball okay but a frisbee is not? Thanks for reading, and I DO appreciate the fact-checking!